Vladimir Putin has chosen Hungary for his first state visit to an EU state since the beginning of the Ukrainian crisis a year ago. Energy issues are expected to top the agenda, yet the Russian leader usually has an ace up his sleeve. The Russian president’s visit to Hungary is keeping EU officials in Brussels guessing about what sort of deals exactly are going to be signed in Budapest. Putin is visiting Prime Minister Viktor Orban at a time of unprecedented confrontation between the western world and Russia over the bloody conflict in Ukraine. The EU has broadened its anti-Russian sanctions on Monday, expanding the blacklist with 19 more people and nine new companies. The EU blacklist now includes 151 citizens of Russia and Ukraine’s self-proclaimed eastern republics, as well as 37 Russian companies. The Kremlin press service said that talks of the Russian and Hungarian leaders will focus on bilateral economic and trade relations, and in particular the nuclear energy deal signed in December. Under a deal worth up to €10 billion, Russia’s Rosatom will build a 2,000 megawatt addition to Hungary’s state-owned nuclear power plant MVM Paksi Atomeromu. Russia is Hungary’s largest trade partner outside of the 28-nation EU, with exports worth $3.4 billion in 2013. Budapest is also highly dependent on Russian energy, both gas and oil refined products. Russia supplies approximately 80 percent of the oil products and 70 percent of the natural gas consumed by Hungary. 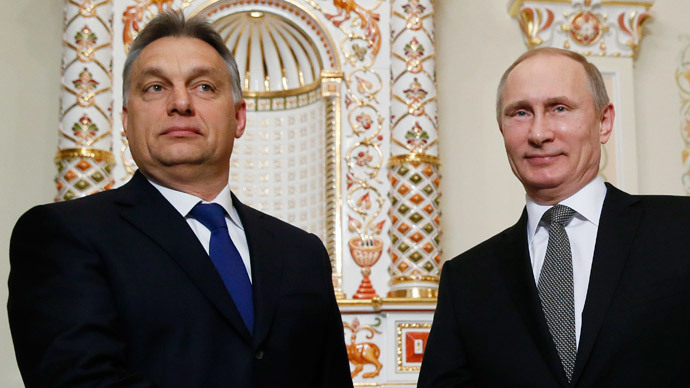 Prime Minister Viktor Orban has been harshly criticized in the west due to his close economic cooperation with Russia. Orban, in turn, is critical of the EU for alienating Russia and plunging into a painful trade war with it. On the eve of German Chancellor Angela Merkel’s visit to Budapest, about 3,000 people rallied in front of the Hungarian parliament holding national and European Union flags and demanding Orban’s resignation. Although protesters represented only about 0.17 percent of Hungarian capital’s 1.75 mln population, PM Orban is being forced to explain to Hungary’s EU partners and people of Hungary that his policies are economically justified. “We don’t want to get close to anyone, and we don’t intend to move away from anybody,” Orban said in November 2014. “We are not pursuing a pro-Russian policy but a pro-Hungarian policy,” he added, advocating expansion of the only Hungarian nuclear power plant, explaining that this is the “only possible means” to lower dependence on external energy resources. EU critics tend to accuse PM Orban of authoritarian trends because of the reforms he introduced to transfer more powers to the central government to effectively leverage large business entities, banks, mass media and other centers of power. Orban is also famous for his skeptical attitude towards many European Union’s policies, particularly Brussels’ siding with the US in the sanctions against Russia, a campaign that damages ailing European economies. Despite all the accusations, Orban’s Fidesz party won last year’s general election with a landslide victory, receiving practically 45 percent of votes and securing Orban’s third term as the Hungarian prime minister. Prime Minister’s supporters view his action as defending Hungary’s national interests against agendas of international corporations and foreign governments. Among the biggest successes of the Orban government was the law that forced conversion of mortgages denominated in Swiss francs, which saved Hungarian borrowers from suffering a debt cost hike after Switzerland unpegged their currency from the euro, which resulted in sharp 20 percent gain in value. Hungary used to be a vocal advocate of the South Stream project for exactly the same energy security reason, expecting the pipeline to pass through its territory on the way to Austrian gas hub. When, in late 2014, Russia had to announce discontinuation of the South Stream project due of the restrictive stance of the EU, it became a hard blow for Budapest. Now that the new Turkish Stream project has been announced, President Putin might be visiting Budapest with some kind of a new hard-to-resist gas pipeline offer. In January Hungarian Foreign Minister Peter Szijjarto stated that Hungary is looking forward to delivering Russian natural gas through a new pipeline via Turkey. “We want to start negotiations as early as possible when Turkey decides to purchase natural gas from Russia. We want to start negotiations on how some portion of this natural gas can be transported to central Europe through Turkey,” Szijjarto said during his visit to Turkey, as cited by China Daily. Hungary is already in talks with Serbia and Macedonia on the new natural gas delivery route that might pass from Turkey to Hungary through a Greece-Macedonia-Serbia pipeline.